Sea-grasses are distributed over most of the globe where there is shallow water with a sandy or muddy bottom. Vast underwater meadows of seagrass skirt the coasts of Australia, Alaska, southern Europe, India, east Africa, the islands of the Caribbean and other places around the globe. 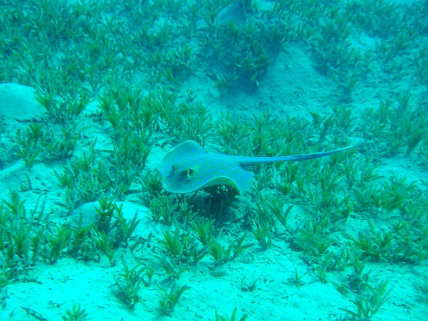 In clear water sea-grasses can extend to 30 meter (100 feet) and sometimes deeper. Seagrasses worldwide encompass about 60 species of marine flowering plants. The term seagrass is used to collectively describe 12 genera of plants that are not in the official "grass family" (Poaceae). They are not even closely related to each other as a whole. One of the regions with the highest diversity in seagrass species is the "Indo-Malaysian triangle" as known from coral reefs. The amount of seagrass species may be low but thousands associated marine plant and animal species utilize the seagrass habitat as a place to attach, feed or as a nursery area. 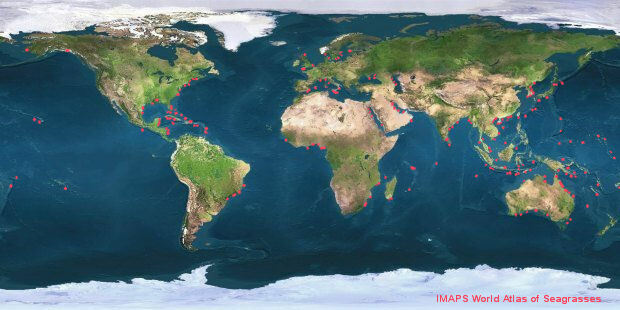 Seagrass beds are among the most productive areas of the world. But in contrast surprisingly few animals consume seagrasses directly. 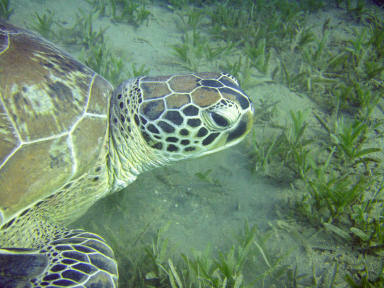 A few species as manatees, dugongs and green sea turtles use these grasses as their primary food source. In some regions also geese and ducks, urchins or some fish species may be found grazing seagrass leafs. Most herbivorous fishes appear to have difficulties digesting sea grasses. They feed on the softer algae that are attached on the grass leaves. This does not mean that the high production of the grasses is lost. Rests of decaying sea grasses on and in the bottom form the start of a (detritus) food chain that supports many animals like worms and clams. These burrowed species on their turn are favorite preys for rays and other species. Seagrass beds are known for their 'export' of organic materials. Rests of seagrasses may be transported out of the area and be used as food in other shallow water communities. Shallow water beds tend to export more material, because they are more often disturbed by water movement and by ice scour and because can be reached more easily by birds. The conventional wisdom has been that seagrass beds are seen as nursery grounds for various commercial important fishes shellfishes. More recent it is suggested that, at least in temperate waters this is not the case. On the other hand a recent research by M. Dorenbosch showed clearly that tropical seagrass beds are important juvenile habitats for coral reefs fishes. In the research areas in the Caribbean and in the Western Indian Ocean seagrass meadows had significant positive effects on many species of coral reef fishes. Globally the estimated loss of seagrass from human impacts amount to 33.000 km2 or 18% of the known seagrass area over the last decades. Reported losses probably represent a small fraction of those that have occurred. Causes of these losses are diverse. An important one is the reduction of light due to sedimentation or nutrient pollution. Also direct damage due to human activity in the coastal zone is an important factor. The impact of climate change is not certain yet.